Can a lightning strike be frozen ? The answer is "yes", we can record and post-process its electromagnetic footprint and analyze it later. This is what we do during VLF recordings, saving thousands of single events, everyone different from each other. There are also other classes of events, like hisses, choruses and so on, but I think that mentioned ones are the most popular, recording can often occur with surplus / homemade circuitry. Even if tweeks and whistlers are the most fascinating events, statics also can teach us something about the complex physics of our thin atmosphere. "Radio Atmospherics" or "Spherics" or simply "Statics" are the electromagnetic signals launched by single lightning discharges. The bandwidth of every signal is very wide, from few Hz to several tens of MHz. Lightning discharges radiate the bigger part of their electromagnetic energy in the VLF (3 - 30 kHz) and ELF (3 - 3000 Hz) frequency range. Due to the fact that lightning happens mainly between stormy clouds and the ground, the radiated energy does not spread out as it should do in free, empty space. The signal is reflected between the ground and a conductive region of the atmosphere called Ionosphere. In the Ionosphere, for the combined actions of various processes (i.e. solar wind) there are many free electrons and ions. These particles (and their concentration) are responsible for the behaviour of this atmosphere layer. 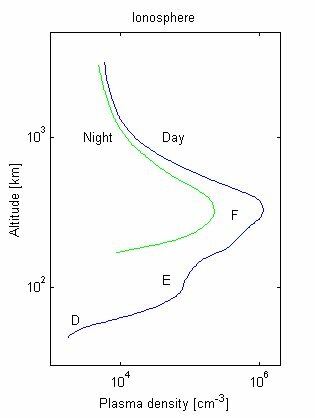 Ionosphere is divided in four sub-regions commonly called "D", "E", "F1" and "F2" layers, the height vary from 60-90 km (for the "D" layer) to 250-300 km. The electrons density has great variations during the cycle night / day, this causes different behaviours. The powerful ultra-violet solar radiation hit neutral oxygen atoms. Photons at these frequencies can dislodge an electron and create an ionized atom plus a free electron. In the image above is shown the difference of the amount of free electrons and ions between night and day, at different altitudes. In the left image is visible the stratification of the atmosphere. The measurement of free electrons in the sublayer "D" is particularly difficult because its height is too low for satellites and too high for balloon probes. It is possible to measure it indirectly, studying the propagation of known VLF emissions . A sferic is defined as the return stroke of a cloud-to-ground lightning discharge. It occurs after a conductive channel has connected electrically the ground and the charged cloud. The current itself is responsible for the transfer of energy and for the emissions in VLF / ELF band. Picture above shows a modelization of the mutiple path of a VLF transmission. Different ionization levels of the ionosphere causes different angles of reflection. Same thing happens also with sferics. Thanks to Dr. Troy G. Wood (PhD at Stanford University), he made clearance about "Lightning Strike" and "Lightning Flash" and other common phenomena related to sferics. There is often a lot of confusion about the term "lightning strike". More often the term "lightning flash" is used incorrectly. Lightning flash refers to the entire lightning event which is composed of many parts. What we record as a sferic is actually created by a single lightning return stroke, duration of the event is only a few milliseconds. Each lightning flash may consist of one, two or even 20 or more return strokes each of which will create a sferic. Return strokes are typically separated by ~60 milliseconds so it is usually easy to resolve individual sferics. However, there is the possibility to record two sferics coming from two different locations arriving at the receiver simultaneously. This will produce an interference. Earth / Ionosphere cavity system has some well defined cutoff frequencies, due to its geometry. Tweeks, for example shows a marked cutoff under a certain frequency. This is because their high frequencies reach the receiver before the low ones. This is called delay dispersion, and it is a typical phenomena when dealing with waveguides. So, every waveguide has a low-frequency cutoff caused by its physical and geometrical size. If the frequency of a signal is close to the cutoff frequency of the waveguide, it will travel slowly then other frequencies. The first cutoff is at about 1.7 kHz (hypotizing an ionized "D" Sublayer at ~70 km above the ground) and occur at about every 1.7 kHz above that. 1.7 kHz and 3.4 kHz are typically observed analyzing tweeks events. Pic shows some sferics and tweeks in the band 0-11 kHz with a FFT of 512 pts (about 2 seconds, recorded in Cumiana Italy by IK1QFK in date 971008-0102). Tweeks present are of 1°, 2°, 3° and 4° order, respectively at frequencies 1650, 3300, 4950 and 6600 Hz. Beyond tweeks, vertical sferics shows an unusual horizontal segmentation. Gap frequencies are always different and are very well spaced and repetitive. It seems that some frequencies are "absorbed" by the earth/cavity system but missing frequencies are not always constant, so there could be a correlation between missing frequency slices and energy/distance of the main event. Every "gapped sferic" appear to have its own range of missing frequencies. So, the behaviour of these sferics is not caused by first cutoff frequency, nor by the second one. Here follow the explaination of the phenomena. "Above the second cutoff the phase velocities of the higher order modes are significantly different from the low order modes causing rapid interference variations. This is very sensitive to distance which may explain why each event has its own footprint. Above about 10 kHz this effect is less rapid due to the introduction of even more modes resulting in a more complex interference pattern and thus a slower variation in signal amplitude. Since the pattern in some of your sferics is visible up to ~20 kHz I would say that these sferics are probably generated by a relatively close lightning strike, say ~200-400 km"
"Also, the spectrum of a lightning stroke is not composed by "pure" white noise, but looks more like a decaying exponential (in VLF) but this won't affect the interference pattern a a particular frequency only its amplitude". As said, above the cutoff frequencies higher order modes can add constructively or destructively to the signal (this is the reason for the segmentation). It may be possible to to get some range information from this but it has not been done at VLF frequencies. With this informations I have added another little piece to my knowledge about VLF and its complex phenomena, hope this document will help someone else. Dr. Troy G. Wood (Stanford University, USA) for his patience and collaboration. Dr. Uman Inan (Stanford University, USA) for his kind collaboration. E-mails between me and Dr. Troy G. Wood. Dr. Michael P. Johnson "VLF imaging of lightning induced ionospheric disturbances"
Dr. Steven A. Cummer "Lightning and ionospheric remote sensing using VLF/ELF radio atmospherics"